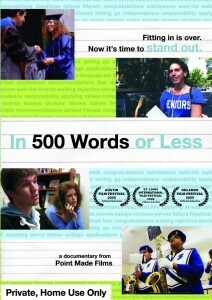 In 500 Words or Less is now available for download. Downloads are delivered to you as high-quality, DRM-free, .m4v files. They are playable in iTunes, available free for Windows and Mac. Due to the large size of the video files, it is recommended that you have high-speed internet access. Downloads of In 500 Words or Less are for private, home use only. In 500 Words or Less introduces us to four of the 1.5 million families who navigate the college application process each year. Watch these four high school seniors take on this distinct rite of passage and discover within themselves their own identity, their family’s dynamics and what it feels like to become an adult. If your DVD player cannot play Region 1 DVDs, download "In 500 Words or Less" Private, Home Use or Institutional versions directly to your computer.